Disclosure: I have TSA PreCheck, a Clipper Card, and travel with carry-on bags. If you do not have TSA PreCheck, your security screening will take longer. If you do not have a Clipper Card, you will need to buy a one-way BART ticket prior to riding BART. If you need to check your bags, you will need to drop off your bags before going through security. With that said, here is how to get to the Oakland International Airport Escape Lounge like a pro. Good morning everyone. Last week, I wrote Get to the SFO Centurion Lounge Like a Pro. I wanted to show the East Bay some love too, so I will show you how to get to the Oakland International Airport Escape Lounge like a pro. This lounge is part of the Escape Lounge collection and is accessible for free if you have an American Express Platinum Charge Card (you can bring in 2 guests for free). The lounge is located in Terminal 1, between gates 8 and 8A. The lounge opens at 5am and closes at 9pm, unless the airport is quiet and the lounge will close early. I’ve been to the Escape Lounge a few times and I recommend reading Points with a Crew’s review of the Escape Lounge. Since I work in San Francisco, I take BART (Bay Area Rapid Transit) to the Oakland International Airport. You need to take BART to the Oakland Coliseum station (home of the Oakland Raiders, Oakland A’s and Golden State Warriors). If you are taking BART right before the game begins or right after the game ends, expect slight delays and crowded trains. 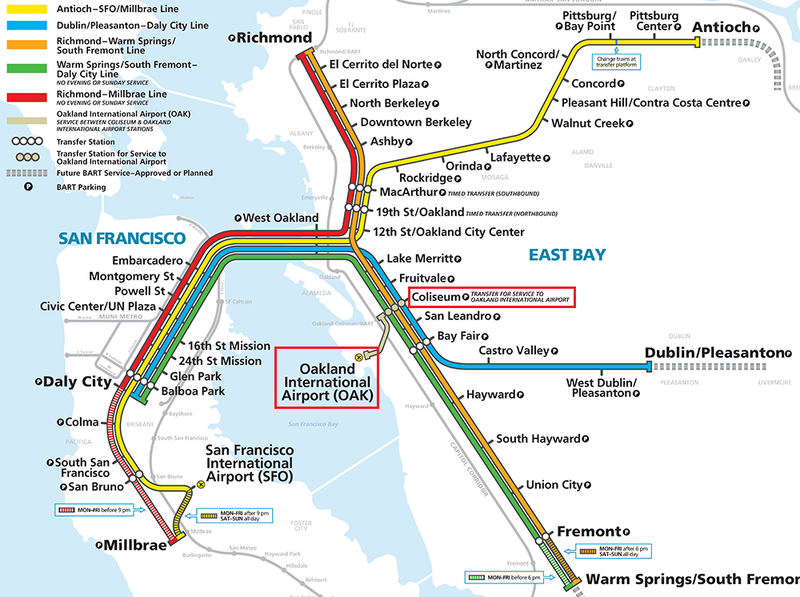 Once you get to the Oakland Coliseum station, you need to transfer to the Oakland International Airport BART train. I call this the “Mini BART” since it is only 2 cars and takes ~7 minutes to go from the Oakland Coliseum station to the Oakland International Airport BART station. If you do not have a Clipper Card, you will need to buy a one-way BART ticket prior to riding BART. Starting at SFO (yellow line), take the Antioch train (yellow line) to Balboa Park and change to the Warm Springs / South Fremont train (green line) or Dublin / Pleasanton train (blue line). Starting at Millbrae (red line), take the Richmond train (red line) to Balboa Park and change to the Warm Springs / South Fremont train (green line) or Dublin / Pleasanton train (blue line). Starting at Richmond (red/orange line), take the Warm Springs / South Fremont train (orange line). Starting at Antioch (yellow line), take the SFO train (yellow line) to MacArthur station and change to the Warm Springs / South Fremont train (orange line). Starting at Dublin / Pleasanton (blue line), take the Daly City train (blue line). Starting at Warm Springs / South Fremont (green/orange line), take the Richmond train (orange line) or the Daly City train (green line). When you get to the Oakland International Airport BART station, take the elevator or escalator down. When you get off the elevator or escalator, turn right toward Terminal 1. Then cross the street to get into the terminal. Once you are in Terminal 1, check your bags (if necessary), then go through security (red line on the map). There is a TSA PreCheck line, so you should be through security pretty quickly. Once you are through security, walk to the Escape Lounge (located between Gate 8 and 8A). Show them your American Express Platinum Charge Card and enjoy the lounge. If your flight departs from Terminal 1, you have a short walk to your gate. If you are flying Southwest Airlines, you will have a slightly longer walk to Terminal 2. You do not need to need to go out of security and back through security, just walk the airside path from Terminal 1 to Terminal 2 (green line on the map). If you are flying Southwest Airlines and need to check your bags, go to Terminal 2 first. After you go through security (there is TSA PreCheck at Terminal 2 also), walk the green line on the map to the Escape Lounge. The Oakland International Airport Escape Lounge is not as good as the SFO Centurion Lounge, but this is the only lounge at Oakland International Airport, so it’s better than waiting at your gate. If you have any questions about the Oakland International Airport Escape Lounge, please leave a comment below. Have a great day everyone! This entry was posted in Credit Cards, Trip Reports and tagged American Express, AMEX, Free Stuff, lounges, Travel, Travel Credit Cards. Thanks for this post, Grant! I’ll be flying in/out of Oakland for the first time in November and want to check out the Escape Lounge while I’m there. I’m glad my post could help. If you are flying SWA, you will need to walk from terminal 2 to terminal 1 to get to the lounge. If you are flying any other airline, your walk should be really short. Let me know what you think of the Oakland Escape Lounge after you visit.